For his first couture showing since becoming creative director at Dior, designer Raf Simons impressed. His feminine approach paid homage to Dior’s original chic designs, from the show’s opening tuxedo jacket and cigarette pants to its last embroidered tulle dress. Adding in his own preference for deep pockets and bold pops of color, Simon's 2013 collection didn’t disappoint the boldfaced fashion names who showed for the highly anticipated debut. 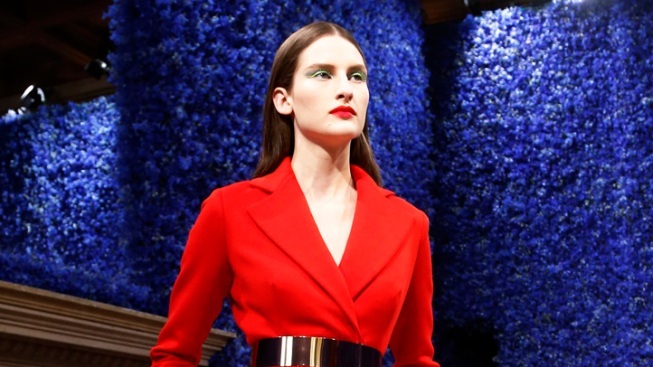 By updating patterns, Dior tweeds became ruby red coats with chunky, cinching belts, while the classic strapless dress transformed into a modern geometric design with a shimmering overlay. Simons, of course, replaces former chief designer John Galliano, who was fired in February 2011 after a drunken, anti-Semitic tirade at a Paris cafe.